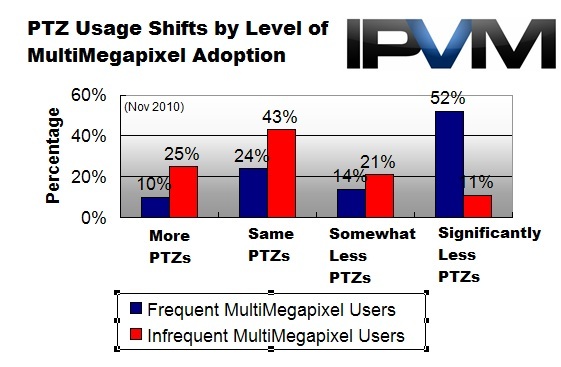 Statistics: Is Megapixel Replacing PTZ Cameras? Of the respondents, the largest group answered that they were deploying the same number of PTZs as before, at 35%. 28% answered they were deploying somewhat fewer PTZs, and 25% answered they were deploying significantly fewer PTZs. Lastly, 12% answered that they were now deploying more PTZs. Combining the two "less" options, we see that a total of 53% of respondents are deploying fewer PTZs than they were three years ago, quite a significant number. The number one reason cited for this reduction was the increase in megapixel camera usage. "With lower cost of Megapixel cameras, I can deploy more cameras providing a wider area of true coverage than by using PTZ's." "Used to deploy quite a bit of Pelco Spectra 3/4 in analog days but now we are deploying a lot more megapixel fixed cameras"
"Megapixel can substitute in many situations. Besides we prefer well located fixed cameras." "We don't see as many PTZ's as before, seems to be a movement away from PTZ's toward more fixed and/or IP MegaPixel Cameras." "We install more megapixel cameras now than PTZ's. We like to increase the number of MP cameras; and use a few PTZ's to supplement the MP cameras where needed." "No need. If you are doing IP Systems, the biggest upsell is megapixel. Most customer's don't have security guards watching the system, so a MP camera is much more effective." "Less customer requirement. We've actually been replacing some PTZs with multi-megapixel IP cams." "Not needed as often. Megapixel cameras, particularly 180 panoramics can replace PTZ's sometimes, though not all the time." "This is just beginning to change with the new 180 and 360 cameras." "Large megapixel and 180 degree cameras have greatly reduced the need for PTZs in field." "A few locations we have put 360 cameras up on the corner and turned off one of the channels." As we have discussed in the past (see our PTZ vs. Megapixel Shootout), megapixel cameras are not a replacement for PTZs, assuming the PTZ camera is manned by a human operator. If the PTZ is simply set on tour, it is extremely likely to miss activity in areas where it is not currently aimed. Those deploying multi-megapixel cameras often are more than twice as likely to be deploying fewer PTZs now (66.67% vs. 32.14%). Conversely, those rarely or never deploying multi-megapixel cameras are more than twice as likely to be installing more PTZs (25% vs. 9.52%). There is a fine balance to be struck between megapixel and PTZ usage. Historically, PTZs were often misused, being installed in applications where no human operator was ever controlling them. This gave end users the illusion of broader coverage, though in reality the camera was less likely to catch actual events. Multi-megapixel cameras, while not a perfect solution, solve some of this issue, by providing better pixel density. However, we see mis-application of these cameras as well, with them being installed in areas where a customer would be better served by having the manual control and increased range of a PTZ. Multiple respondents cited budget cuts and staff reductions as reasons for adding more fixed cameras instead of PTZs. With budgets shrinking in most verticals, trained security officers are either not hired, or repurposed elsewhere, instead of watching monitors. This drastically reduces PTZ effectiveness, and we have heard numerous complaints from end users regarding PTZs "always looking in the wrong direction". "Budget cuts are eliminating many of the people who used to sit and operate them." "PTZ deployments are very specific and limited based upon human intervention in operation system. More video surveillance we integrate is forensic in nature, and unless active operators are present to utilize PTZ functionality, we instead opt to design fixed cameras into systems." "Megapixel views compensate, and more systems are using fewer guard station staff." "Most customers don't have security guards watching the system, so a MP camera is much more effective." While PTZs are nowhere near being 'elimated' overall, the trend is clearly shifting away from using PTZs. Based on these numbers we anticipate a steady decline of PTZ use until PTZs are only used for systems where live monitoring is required / available.